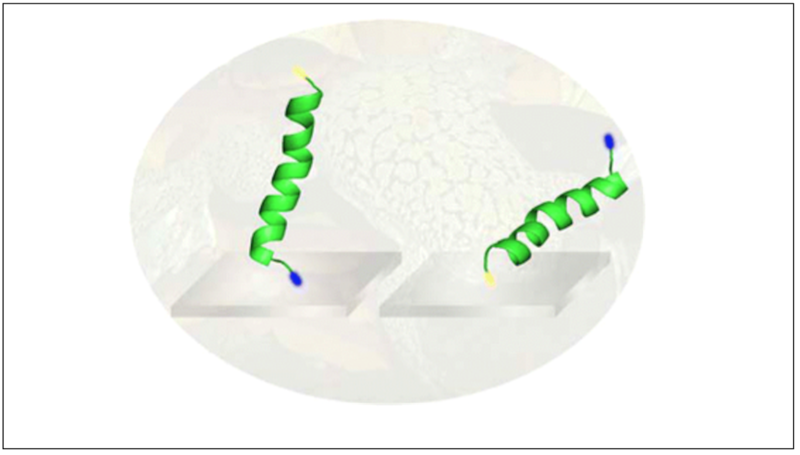 Surface immobilized enzymes are widely used in biosensing applications. When enzyme molecules are deposited onto a surface, some molecules may adopt wrong orientations and subsequently lose their activity. We aim to develop a systematic approach to determine enzyme orientation after surface immobilization in order to understand the enzyme structure-function relationship. We have elucidated the effects of enzyme surface immobilization site location, number of immobilization sites, enzyme surface coverage, and substrate surface property on the orientation of surface immobilized enzymes. Sum frequency generation (SFG) vibrational spectroscopy has been extensively applied in this research, supplemented by attenuated total reflectance – FTIR (ATR-FTIR) spectroscopy, circular dichroism spectroscopy, and molecular dynamics simulations. Compared to traditional industrial catalysts, enzymes have many advantages. For example, their reaction conditions only require standard pressure, and are “greener” (or more environmentally sustainable). However, enzyme production can be quite expensive, therefore it is necessary to enhance the efficiency and reusability of such biocatalysts. To do so, enzymes are typically immobilized on surfaces for use. 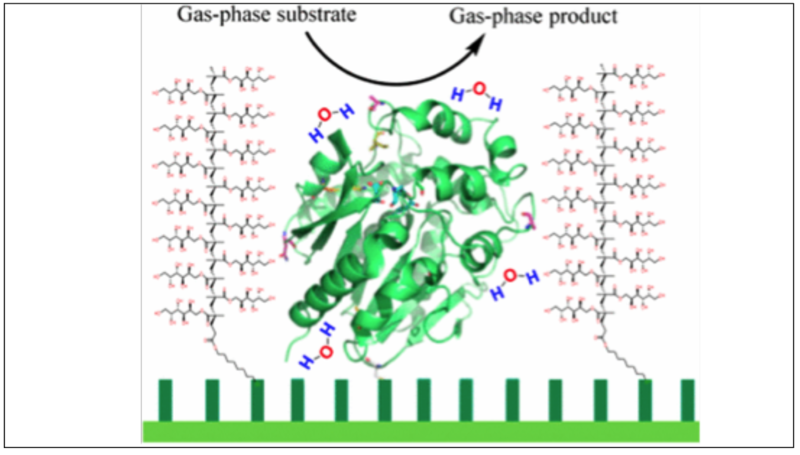 To better understand how immobilization affects enzyme structure and activity, we have developed a method to measure both surface-sensitive SFG vibrational spectra from enzyme and enzymatic activity simultaneously. 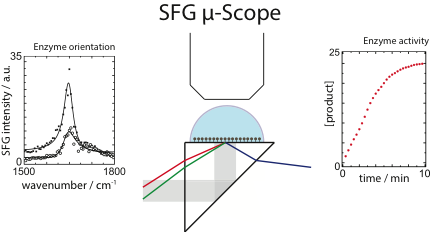 An optical/fluorescence microscope was incorporated into a sum frequency generation (SFG) spectrometer. This analytical system was applied to study surface immobilized β-glucosidase (β-Glu), an enzyme widely used for biofuel production. 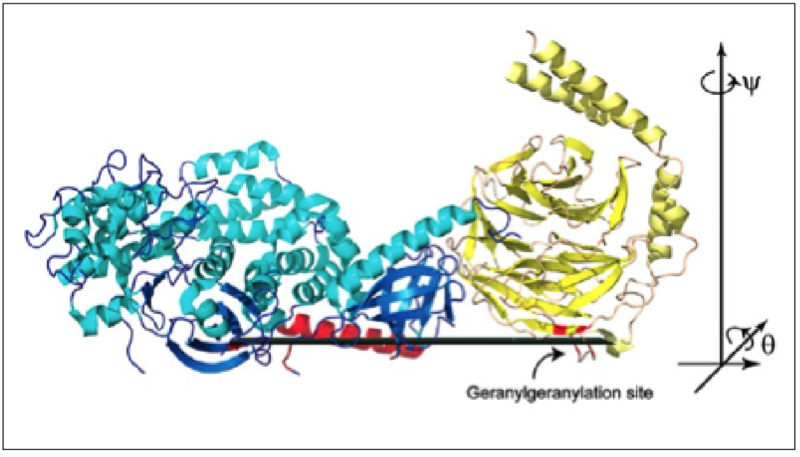 The orientation of surface immobilized enzymes were determined by SFG spectroscopy, and activity measured simultaneously using fluorescence imaging, providing more accurate information for designing and further improving enzymatic activity of surface bound enzymes. Antimicrobial peptides (AMPs) can kill bacteria by disrupting bacterial cell membranes, which is an effective mechanism that drug therapy can use against developing resistance against common antibiotics. Surface immobilized AMPs have been widely used for antimicrobial coatings and for bacteria capturing. The antimicrobial activity of AMPs can be greatly reduced after the surface immobilization. Here we investigated effects of the peptide surface immobilization site, the surface immobilization strategy, and chemical environment on the surface immobilized peptide conformation and orientation, elucidating the structure-activity relationships of surface immobilized peptides. Many applications involving the use of surface immobilized peptides and proteins are in air, without the presence of bulk water. Without bulk water around the peptides and proteins, they often denatured and lose their activity. We co-immobilized hydromimetic molecules such as poly-sugar molecules with peptides and proteins on surfaces to protect biomolecular structure in air without bulk water. Using this methodology, the activity of surface immobilized enzyme can be enhanced by forty times. 2D materials such as graphene and MoS2 have been extensively used in many applications involving interactions with peptides and proteins, such as biosensors, nanobio-composite materials, biofuel cells based on enzymes, and biomolecule separations. Therefore it is important to understand molecular interactions between peptides/proteins and different 2D materials. 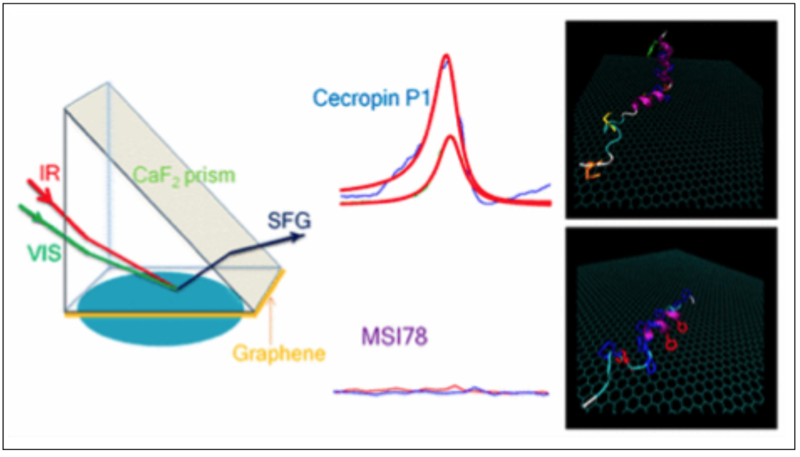 Using SFG and MD simulations, we elucidated such interactions between various peptides and graphene as well as MoS2, and developed a systematic approach to control the peptide orientation on such 2D materials quantitatively. Currently we are studying interactions between various proteins and 2D materials. Membrane proteins play important roles in biological functions and more than 50% of the drugs target membrane proteins. In order to understand membrane functions and how they interact with drugs, it is necessary to understand membrane protein structures. 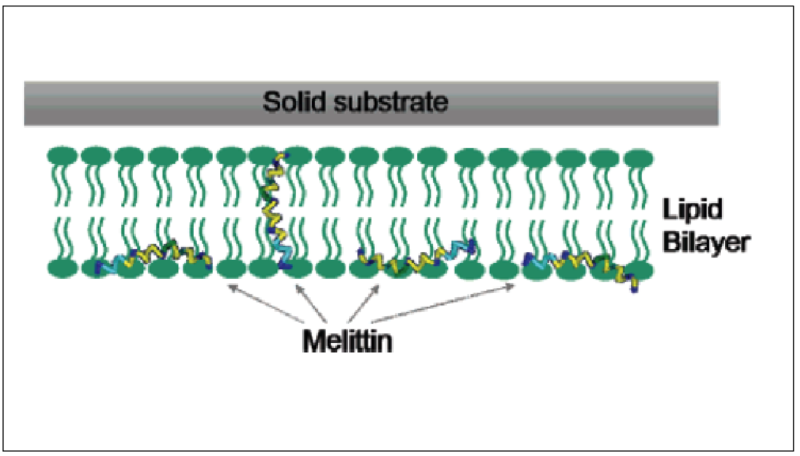 However, it is difficult to obtain structural information of many membrane proteins because they are difficult to crystalize, and it is difficult to get protein structural information in situ in membrane environment. We successfully applied SFG to elucidate membrane orientations of a variety of membrane proteins including Gβγ, GRK2, Gαβγ, GRK5, cytochrome b5 etc. 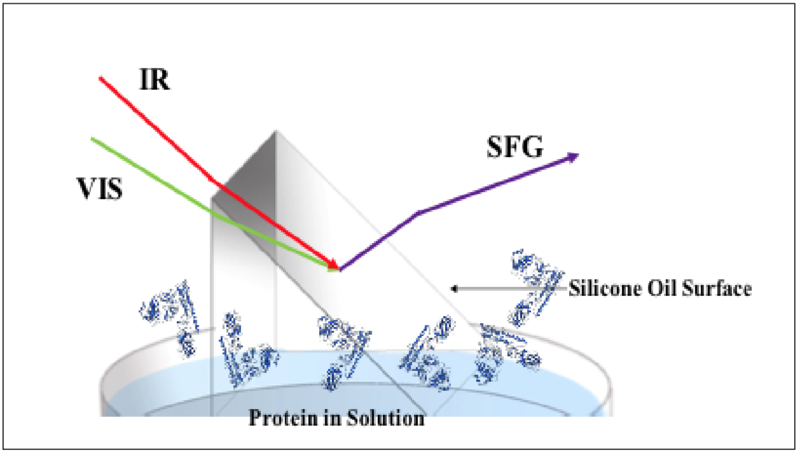 With the help of ATR-FTIR and a computer software package developed in our lab which can predict SFG response of a protein as a function of protein orientation, we can accurately determine complicated membrane protein in situ. Bacteria can develop drug resistance against traditional antibiotics, causing therefore many infectious disease can cause serious threat. Antimicrobial peptides kill bacteria by disrupting bacteria cell membranes; it is difficult for bacteria to develop drug resistance against antimicrobial peptides. We extensively applied SFG to study antimicrobial peptide-model cell membrane interactions to understand the activity and selectivity of antimicrobial peptides, aiding in the design and development of antimicrobial peptides with improved performance. Protein drugs are more and more widely used to cure many diseases. Proteins can interact with various interfaces encountered during pharmaceutical manufacturing processes and delivery of these drugs to the patients. Such interactions may change the protein structure and cause protein aggregation, which will lead to concerns in the development of protein therapeutics due to their implications in the product safety, immunogenicity and potency. We applied SFG to investigate protein behaviors at various interfaces to understand the molecular mechanisms of protein drug-surface interactions. In addition, we investigated how additives in the protein solution or pre-adsorbed to the surface could prevent proteins from segregating to the surface.